At Down 2 Earth Garden Centre our knowledgeable and friendly staff can help you with any gardening, planting or landscaping question. Conveniently located in Toronto on Parklawn and north of Lakeshore. For a quick response, please call us. 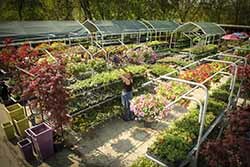 Our monthly newsletter deliver promotions, savings and what's new at the Down 2 Earth garden centre. Very helpful and knowledgeable staff. Range of products is good. Follow-up advice always available. Our go-to place for our indoor apartment garden. Both helpful and friendly, my first time visiting the garden centre was excellent. They made me understand which plants I should get based on the location around my home. The lady there was very helpful and knowledgeable.